There are concerns that the incident may be a terror attack linked to a now cancelled Prophet Muhammad cartoon competition in parliament. Dutch police were investigating a suspected terror attack at Amsterdam’s Central Station, in which two people were stabbed before the knifeman was shot by police. The US embassy said on Saturday that both attack victims were US citizens. The assailant was identified as an 19-year-old Afghan man with a German residency permit. “We are seriously taking into account that there was a terrorist motive,” Amsterdam police spokesman Frans Zuiderhoek told AFP. Earlier witnesses described scenes of panic as gunshots rang out and thousands of commuters and tourists were evacuated from the rail terminus shortly after midday. 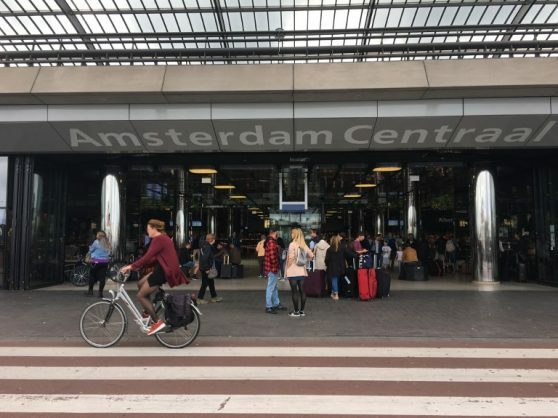 “A man in the west side tunnel of Amsterdam Central Station stabbed two other people and directly after that he was shot by the police,” another police spokesman Rob van der Veen said, adding terrorism was not being ruled out by investigators. “The two people are very badly injured, and they were brought to the hospital,” he said. One witness said he saw a young man “stumble” into his flower shop at the station with a bleeding wound to his hand. “Shortly afterwards I heard some shots and I know something has gone badly wrong,” Richard Snelders told the ANP news agency. A while later he saw another man lying on the ground nearby, he said. “The first thing that comes up in your mind is that it’s a terror attack. After all, you are at Amsterdam Central Station. There was a lot of panic,” Snelders said. Police quickly arrived at the scene with video images showing police ordering the suspect in English to “stay down” after he had been shot. Images posted on social media showed security guards ushering passengers towards exits and paramedics arriving at the scene with stretchers. Police spokesman Zuiderhoek said the knifeman’s condition was not life threatening, but that he had been shot in the lower body. “At this moment he is under police custody in hospital. He is being questioned about his motive,” Zuiderhoek added. Dutch police were also in close contact with their German counterparts in regards to the suspect’s background, he added. Two platforms at the station — located in the Dutch capital’s historic canal-ringed city centre — had been evacuated and closed off to passengers, police said, and were reopened for rail traffic two hours later. A special police department opened a routine probe into why police shot the man. The Netherlands has so far been spared from the slew of terror attacks that have rocked its closest European neighbours in the past few years. Police declined to speculate on the reasons for Friday’s incident, but the Afghan Taliban in a statement Thursday called for attacks on Dutch troops following plans by Dutch far-right politician Geert Wilders to stage a Prophet Muhammad cartoon competition in the Dutch parliament. Wilders, who received several death threats, has since cancelled the competition, which has angered Muslims and sparked protests, saying he wanted to “avoid the risk of making people victims of Islamist violence”. Around 250,000 people travel through Central Station every day, according to statistics provided by the Amsterdam.info travel guide.